Do you like modern art/photography? Especially abstract modern art…? Or does it frustrate you? Does it feel like the artist is being deliberately obscure, cloaking an image in obfuscation, and then calling it Art! I must admit I can have both reactions… But with this image by Sandy Weir I’m definitely in the former camp. To me this is beautiful, delicate and wispy. And yet on first viewing I had no idea what it was a picture of. It does not reveal its connection to reality so easily. And maybe right there – in that moment of hesitation as the mind tries to comprehend what the eye is seeing – is the fascination. So I want to try and unpack that reaction a little more, to understand what is going on. I wonder if you react the same way I do? The first reaction when we look at an image is to seek meaning. With landscape in particular that recognition often comes instantaneously – “it’s a mountain”, “a tree”, “a shore line”. Often the eye will immediately flick to the caption – to seek confirmation of meaning perhaps: “Ah yes, Scotland, Iceland, Yosemite – knew it!”. 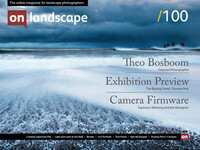 Let me ask you a question: you’ve gone through this edition of On Landscape and looked at many photographs (Tim always puts me at the end, so I’m betting you’ve looked at a lot of images by now...). How often, and how quickly, did you check the caption? Now ask yourself, did the caption really add to your appreciation of the image?